Whether you’re a new Salesforce Admin, or a seasoned veteran, with Salesforce, there is always something to learn. These ten random tips will keep you ahead of the Salesforce leadership curve, curious for more new information, and excited about your workflow. Many new admins might not know this capability is here. If you want to be able to track important fields, update and know who to update, turn on your field history, and set it up on the objects that you need it. If you have been using Salesforce for a while, you know that Duplicate Records are a key thing. Data is a huge component of this. Ledgeview highly recommends turning this Salesforce feature on, identifying duplicate rules that you want, and making sense of the information you have with your Salesforce Org through the process. Sometimes even small changes can have significant negative consequences. Salesforce, at all licensed levels, has a sandbox for you to build and develop things in, and be able to manage there. You can create changesets in sandboxes, then move them up to production. Remember, even small changes can impact production. Depending on your Salesforce licensing level, you are able to export data out and download it into a flat file. It’s great for keeping a backup history, especially for the times your customers come back to you later requesting information they’ve misplaced. If you’re a new admin, and you start creating many objects, you need to understand what record types do and what their power is before you get too excited. There’s always a reason to use new objects, but it’s crucial to understand what new record types can do for you, whether it’s for competitor or vendor purposes. You can manage this with record types instead of creating a whole object. If you ever create a report, and your record counts don’t seem to match up, this counts every single record related to that record. For example, you may have opportunities related to products. It makes many relationships, referred to as dub accounting. If you ever run into this, read up on the Power of One online. The Power of One offers Salesforce Admins a great way to be able to accurately get counts on records if you’re trying to group them by specific values. There’s a lot of good out-of-the-box report types, but some can get a little messy. Creating types will help you eliminate user confusion. Nearly half of the apps listed on Salesforce AppExchange are totally free. You’ll find apps of all types and may eliminate the need to build from scratch with AppExchange. Look around before you create your own little Salesforce monsters. You could save a lot of time with a simple search. The possibilities are (almost) endless. If you can’t figure something out in Salesforce, it’s better to step back than to do it wrong and screw it up. Take your time. The client would rather have you admit you don’t know how to do it and take the time to figure it out, rather than jump in without the knowledge and resources you need to excel. As a new admin, seek out a mentor to help you or conduct appropriate research. You’ll get it! You will learn little tricks here and there, and then go back and revisit former tasks with that new knowledge. Be sure to maintain the one task at a time approach. It will help keep you focused and allows you to retain the information better. There is a lot to learn. Take your time. Be efficient with how you use that time, and enjoy the learning process. 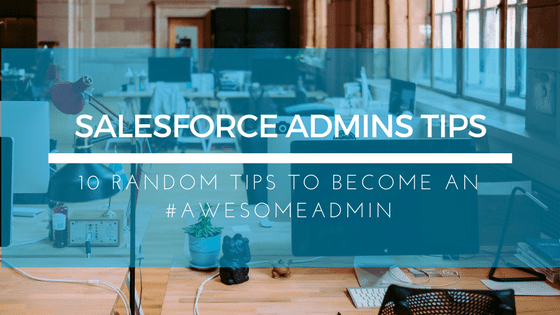 Want more Salesforce Admin tips? 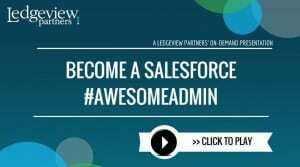 Click here to watch this #AWESOMEADMIN webinar.